JOL: Syrian media outlets reported early Wednesday morning that army forces have responded to an Israeli airstrike near Damascus. The media outlets said that the “an act of Israeli aggression” targeted a research center in Jemraya. According to the Syrian Army, the aircraft fired on the site from Lebanon’s airspace. Syrian air defense forces shot several missiles at the alleged Israeli fighter jets and the missiles that they supposedly fired toward the site. The incident reportedly took place around 4:00 AM. Syria accused Israel of attacking the same site in 2013 and 2017, the Al-Hayat newspaper noted. 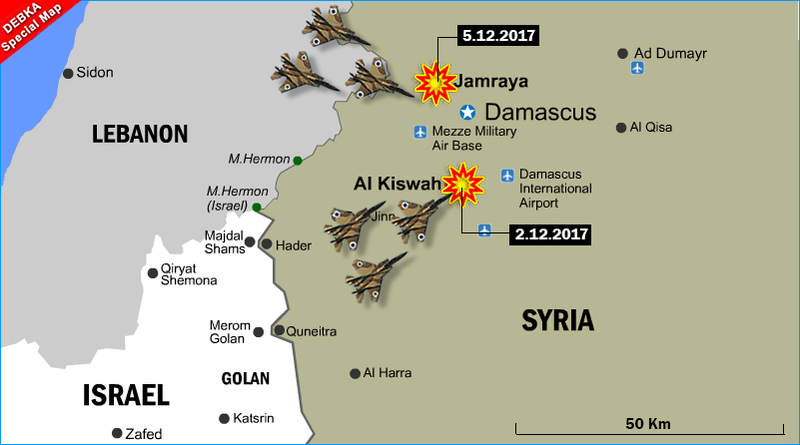 Since that post there have been three strikes in and around Damascus: September 22, 2017 (here) and December 7, 2017 (here), and yesterday (not shown on map). Isaiah penned this prophecy 750 years before the birth of Christ. A Google search (here) of the oldest continuously inhabited cities on earth shows Damascus as number 1. That Damascus was partially destroyed in 702 BC by the Assyrian Empire makes Isaiah’s prophecy even more compelling since it has never been completely destroyed. How great is our God, who made prophecy so clear for those who search for clues of His coming.